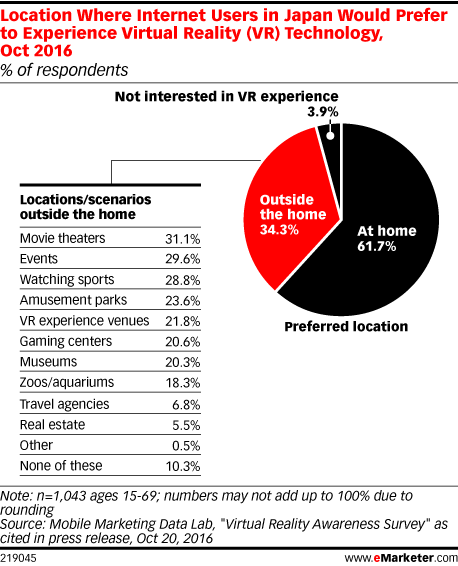 Data is from the October 2016 Mobile Marketing Data Lab "Virtual Reality Awareness Survey" as cited in press release. 1,043 internet users ages 15-69 in Japan were surveyed during October 7-12, 2016. 449 respondents indicated that they are interested in virtual reality (VR), 422 have experienced VR and 172 are VR device owners. Mobile Marketing Data Lab is a mobile marketing data research company headquartered in Tokyo, Japan.